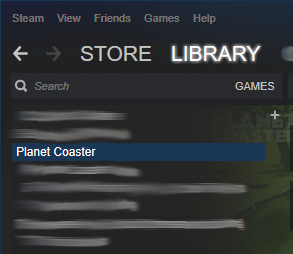 Planet Coaster is for some people the first game they got on Steam. Steam can be a bit overwhelming. There's so much stuff to look at, and the Steam Workshop is a great way to download the creations of others. 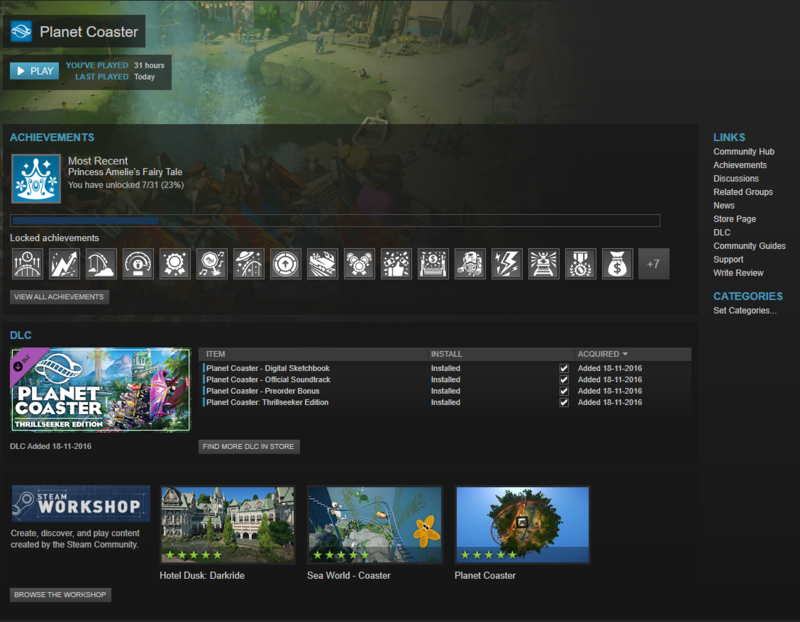 To select any of your games in your Steam library you can click on ''LIBRARY'' in the menu at the top of your screen. You'll see a list on the left of your screen with the names of the games you own. Click on Planet Coaster to get more information. You'll see a screen like this. To play the game you can use the button as displayed below. Next to the button you will find some info about the amount of hours you played the game, and when you've played the game for the last time. In Steam, every game has achievements. Unlocking these is possible by playing the game. You can look at the most recent achievement you've unlocked on the Planet Coaster screen. 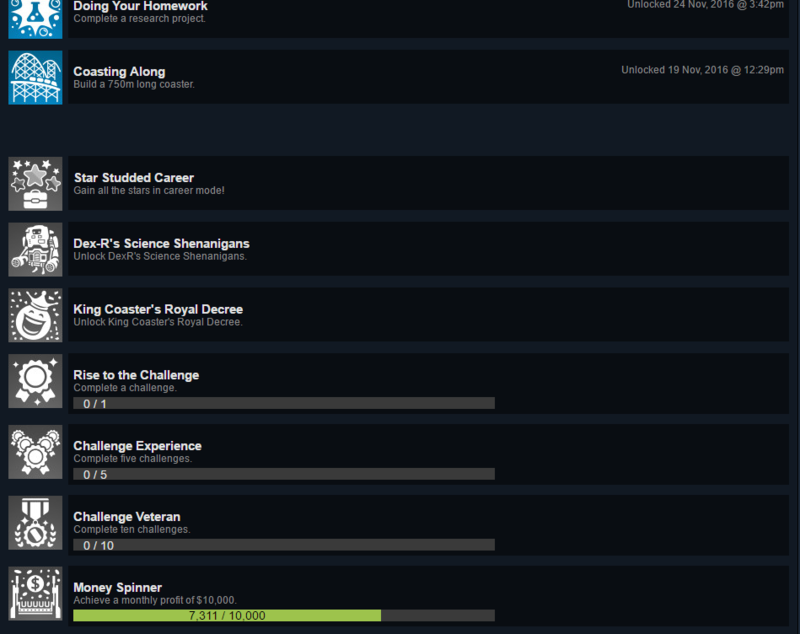 There's also a progress bar to give you an idea on how many achievements you still have to unlock. If you click on ''VIEW ALL ACHIEVEMENTS'' you'll see a screen like this. 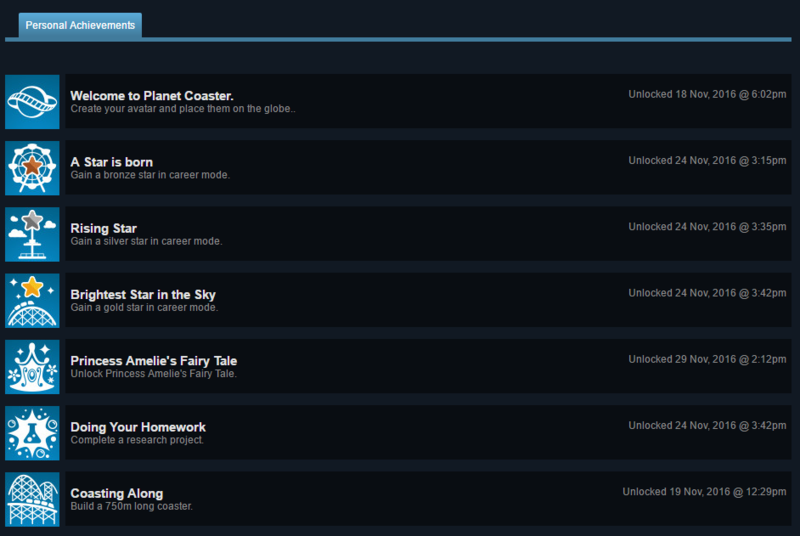 Since I've already played the game, I unlocked some achievements. These will be displayed under the tab ''Personal Achievements''. If you scroll down, you'll see the achievements you haven't unlocked yet. Unlock these by doing what's in the description of the achievement. If a new DLC comes out, you'll be able to find it by clicking on the button ''FIND MORE DLC IN STORE''. I've made a video on how to use the Steam Workshop for Planet Coaster, and I recommend watching it if you're new to Steam. If you have any questions, I'd love to hear them from you . Click the banner to visit my thread! For anyone that might know, how do you remove an uploaded workshop item? I know I can private the item so only I can see it, but is there a way to completely remove it? In the same Owner Control Panel where you change the visibility there is a delete link. 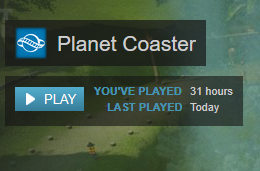 While not that new to Steam, PC and RCTW (oh, come on. it was $5 on sale!) are the first ones that really used the workshop feature for sharing UGC; Now I understand what I'm seeing and how to get it into my game.